I haven’t made any inspiring new recipes (until this past Sunday morning). I’ve been recycling delicious old favorites. We’ve been searching for the perfect chocolate chip cookie recipe. They’re the boyfriend’s favorite thing to spend money on at the grocery. Obviously, I am convinced I can make better than store-bought. We’re very close. I’ve been totally copping out on Songs of the Week by posting just a song, no explanation, on my Tumblr. Nothing noteworthy has happened and I don’t like blogging about random, meaningless things. So, weekend breakfast. It’s my favorite meal of the week. I love taking my time to make something a little more involved, slowly sipping multiple cups of coffee, and not eating like I’m taking part in a competition. I like pancakes, but so often the just basic, run of the mill, buttermilk variety bores me. Pancakes with a twist, an extra ingredient and more dimension, are worthy of weekend breakfast in my house. For my birthday, my sweet brother got me The Essential New York Times Cookbook: Classic Recipes for a New Century. This cookbook is a compilation of over 1,400 recipes gathered from the New York Times food section from as far back as the 1850s. There are sections on everything from drinks to fish to dessert. And a whole section on breakfast and brunch! When I was craving pancakes Sunday morning, I turned to my new trusty kitchen companion, and I found Kathleen Claiborne’s Hot Cakes. 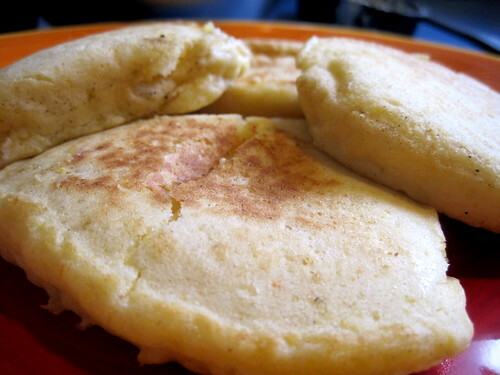 They’ve got cornmeal in them, which gives them a great texture and flavor, and a lovely light yellow color. The whole pouring boiling water over cornmeal and sugar was a bit odd and resulted in a very thick, almost paste-like mixture. But once the milk and oil are added and the egg whites folded in, things even out. I put a bit of syrup on some of mine and apricot jelly on others. Definitely worthy of Sunday breakfast. 1. combine the cornmeal, sugar, and salt in a small bowl. Mix into pot of boiling water, stirring consistently with a whisk. The mixture will be thick. Don’t worry! Cook over medium heat, stirring, for 1 to 2 minutes. Scrape the mixture into a mixing bowl, and let sit for a few minutes to cool, whisking every now and then. 3. Whisk the egg yolk into the cornmeal mixture. Stir in the flour and baking powder. At this point the mixture will be impossibly and ridiculously thick, but it’s all good. Get as much of the flour to disappear as you can. 4. Heat your pan (preferably a cast iron skillet, but any skillet will do) over high heat on the stove. 6. Once your skillet is hot (water droplets splashed onto it will sizzle), spray it with cooking spray. Drop the heat to medium. Dollop 1/4 cup batter into the skillet for each pancake. I fit up to four in mine. Cook until brown on the underside. You’ll know the pancakes are ready to flip when little bubbles start rising to the surface and popping. Do not flip too soon! These actually cooked much faster than regular pancakes, FYI. Turn over and cook the other side until golden brown. Wow, these pancakes sound interesting and delicious (probably even more so because I can’t have them for a while…..). Next time we have a family brunch occasion, let’s make them instead of Belgian waffles, or can we not break traditions? We can definitely break tradition! Then maybe Pappy will actually sit down and eat with us if he’s not up making waffles.